The Milwaukee County Zoo’s 13-year-old Bornean orangutan, Rayma, is making the move to the Phoenix Zoo once keepers determine the weather is milder and more suitable for travel. She joins four orangutans; 31-year-old Michael, 39-year-old Bess, their rambunctious 4-year-old son Jiwa and 12-year-old Daniel in the exhibit, Orang-Hutan: People of the Forest, which opened in April 2014. Rayma is described by her keepers as a curious, sweet and gentle girl who loves oranges. She enjoys playing with bubble bath, bedsheets, blankets, boxes, bags and plastic barrels. All are great forms of enrichment, which keeps her mind active and lets her display similar behaviors to those she would in the wild. 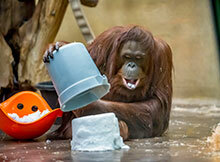 At the Phoenix Zoo, Rayma will join new Bornean orangutan companion, 12-year-old Daniel. Daniel lost his previous companion, 11-year-old Kasih, unexpectedly one year ago from a large brain mass. Rayma’s new companion Daniel is the only orangutan in North America to receive surgery from a human ear, nose and throat doctor. In March 2018 he had surgery for recurring sinusitis with air sacculitis. Sinusitis is the inflammation of a sinus, especially a nasal sinus. The Phoenix Zoo reports Danial is doing incredibly well! Bornean orangutans are critically endangered with a wild population that continues to decrease. These orangutans have broad faces, short beards and dark orange hair. They are only found in rainforests of the Southeast Asian islands Borneo and Sumatra. 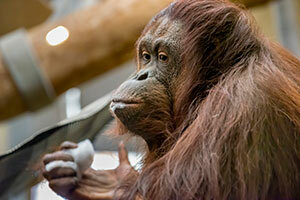 Rayma and her fellow orangutans play a critical role in seed dispersal, which helps keep forests healthy. Over 500 plants have been recorded in their diet! Unfortunately, their habitat has been reduced by 55 percent over the past 20 years due to the expansion of palm oil plantations. Palm oil trees only grow in the tropics and require lots of water. Planting of the trees leads to massive forest destruction. Over half the food on shelves, as well as cosmetics and toiletries contain palm oil, which adds creaminess or foam to a product. For more information and how you can help in the palm oil crisis, visit redapes.org.